I have a 2007 Shadow Areo in pearl white - it is beautiful & I love it. I want it to be louder tho. Any clues? I HAVE THIS SAME BIKE AND I SWEAR I THOUGHT THIS WAS A PICTURE OF ME!!!!!! IF THE SADDLE BAGS HADN'T BEEN DIFFERENT and YOUR SHOES!!! MY BIKE ONLY HAS 5K miles on it and I am interested in selling it. 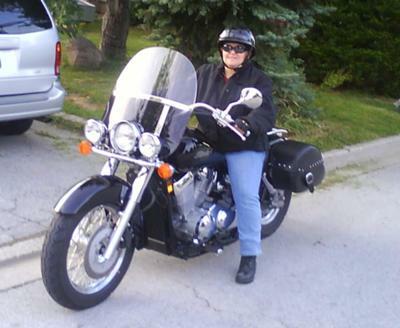 I have a 750 Honda Shadow Aero and love it. Black and chrome. Just got back from 2nd trip to Tennessee, it performed great. Keep riding! Nice bike!! !I got a 2006 750 Aero. I have a few extras put on her now. Mustang seat, highway bar with pegs, fender rail, rad cover, brake peddle and shift peg covers, etc...etc...I love this bike....I would have to say Ride On!!! Nice Bike. I have a blurple 2004 Aero with Hard Kromes on it. They say the black ones are the fastest. Make sure you wear ear plugs. Those Hard Kromes can be loud. There's a great forum for Aero riders if you haven't already found it. Ride safe. Congratulations on your shadow. It is a nice bike. I have one too, and I love it. I'm sure you will love yours too!